This is a legal agreement between you and music store Mp3million.com located at www.mp3million.com and/or its affiliates (hereinafter referred to as the "Site"), which is property of Mp3million LTD, providing music for digital downloading (hereinafter referred as the "Service") stating the terms that govern your use of the Mp3million music store. You must accept and abide by the terms as presented to you, and the Mp3million LTD reserves the right to change, add, or remove portions of this agreement at anytime. It is your responsibility to check the Agreement each time before using the website, and your continued use of the website will indicate your acceptance of any changes. BY USING THE SITE YOU CONFIRM YOUR AGREEMENT TO THESE TERMS. IF YOU DO NOT AGREE TO THESE TERMS, DO NOT USE THE SERVICE. SITE RESERVES THE RIGHT TO ENFORCE THE CONTENT USE RULES WITH OR WITHOUT NOTICE TO YOU. Your access to and/or use of any Track(s) will be limited by the rules assigned to the Track(s) by Site ("Content Usage Rules") and described in this section. You may not attempt, nor support others' attempts, to decrypt, reverse engineer, circumvent or otherwise alter or interfere with any software required for use of the Service or any of the Usage Rules. You agree to pay for Service provided by Site. You agree with prepaid payment system used on Site. You are responsible for any charges on your account that are incurred by any person through your account, and you are solely responsible for keeping your account secure and confidential. Site reserves the right to refuse Service or sale of Products for any reason, to any End User. Prices and Availability of Products (e.g., Tracks and Materials) offered through the Service are subject to change at any time. Site does not provide price protection or refunds in the event of a price drop or promotional offering. If you are dissatisfied with the quality of our services, you may request a refund, which will be considered by administration of Site. For this purpose you should direct the application to the email address: refund@mp3million.com with detailed explanation of the reason why refund should be made to you. Refunds can be initiated for the following reasons: double and/or accidental deposit; corrupt content on our web site; unauthorized payments. ll taxes included in price of song/album. We have not any extra fees. You pay for purchased music ONLY. Site currently accepts Visa, Master Card credit cards. Site does not accept cash, money orders, or checks. Site reserves the right to change this policy at any time. You agree to pay all fees and charges associated with your purchase(s), (including any applicable taxes), at the rates in effect when the charges were incurred. You, not Site, are responsible for any unauthorized amounts billed to your credit card by a third party. As a cardholder, your card issuer agreement governs your use of the designated card, and as such, you must refer to that agreement to determine your rights and liabilities as a cardholder. Obligation to pay for Products or Digital Download orders previously accepted by Site will survive your termination of the Terms and Conditions of Usage. By posting messages, inputting data, or engaging in any other form of communication through the Service, you agree that Site may copy, sublicense, adapt, transmit, publicly perform or display any such content to provide and/or promote the Service and/or to respond to any legal requirement, claim or threat. If Site's use of such content exploits any proprietary rights you may have in such material, you agree that Site has an unrestricted, royalty-free, non-exclusive and perpetual worldwide right to do so. You represent and warrant that you own or otherwise control all applicable rights to the content, material, messages and the like that you post, upload, transmit or display; that the content, material, messages and the like are accurate; that use of the content, materials, messages and the like that you supply does not violate third-party rights and will not cause injury to any person or entity; and that you will indemnify Site, its partners, parents, subsidiaries, agents, affiliates and/or licensors, as applicable, for all claims resulting from content, messages, materials and the like that you supply. You agree that any loss or damage of any kind that occurs as a result of the use of any messages, content or material that you upload, post, transmit, display or otherwise make available through your use of the Service is solely your responsibility. All copyrights in and to the Service, including but not limited to, the Site music store (Including the compilation of content, postings, links to other Internet resources, and descriptions of those resources) are the property of their respective owners. The use of any part of the service, except for use of the service as permitted in this Agreement, is prohibited and subject to civil and criminal penalties, including possible monetary damages, for copyright infringement. The availability over the Internet of the Mp3million.com materials is authorized by the license # 67/17M-10 of the Rightholders Federation for Collective Copyright Management of Works Used Interactively (NP "FAIR") issued for Mp3million LTD. All these materials are solely for personal use. Any further distribution, resale or broadcasting is prohibited. All trademarks, service marks, trade names, slogans, logos, and other indicia of origin that appear on or in connection with the Service are the property of Site and/or its affiliates, licensors and/or licensees. You may not copy, display or use any of these marks without prior written permission of the mark owner. If Site receives a notice alleging that you have engaged in behavior that infringes Site's or other's intellectual property rights or reasonably suspects the same, Site may suspend or terminate your account without notice to you, and shall have no liabilities to you, past or present, for suspension or termination under this paragraph. Site reserves the right to enlist and take measures that Site believes are reasonably necessary to enforce, or appropriate to enforce, or verify compliance with any part of this Agreement (including but not limited to Site's right to cooperate with any legal process relating to your use of the Service and/or Products, and/or a third party claim that your use of the Service and/or Products is unlawful and/or infringes such third party's rights). You agree that Site has the right, without liability or notice to you, to disclose any Registration Data/Account information to law enforcement authorities, government official, and/or third party, as Site believes is reasonably necessary or appropriate to enforce and/or verify compliance with any part of this Agreement (including but not limited to Site's right to cooperate with any legal process relating to your use of the Service and/or Products, and/or a third party claim that your use of the Service and /or Products is unlawful and/or infringes such third party's rights). By using this Service you agree to indemnify and hold harmless Site and its agents, employees, directors, contractors, representatives, licensors, affiliates, parents and subsidiaries from and against any and all claims, losses, demand, causes of action and judgments (including attorneys' fees and court costs) arising from or concerning your breach of this Agreement and your use of the Service, the Tracks, the Materials, and Content and to reimburse them on demand for any losses, costs or expenses they incur as a result thereof. E. This Site may contain links to other independent third-party Web sites ("Linked Sites"). These Linked Sites are provided solely as a convenience to our visitors. Such Linked Sites are not under Mp3million's control, and Mp3million is not responsible for and does not endorse the content of such Linked Sites, including any information or materials contained on such Linked Sites. You will need to make your own independent judgment regarding your interaction with these Linked Sites. MP3MILLION DOES NOT PROMISE THAT THE SITE OR ANY CONTENT, SERVICE OR FEATURE OF THE SITE WILL BE ERROR-FREE OR UNINTERRUPTED, OR THAT ANY DEFECTS WILL BE CORRECTED, OR THAT YOUR USE OF THE SITE WILL PROVIDE SPECIFIC RESULTS. THE SITE AND ITS CONTENT ARE DELIVERED ON AN "AS-IS" AND "AS-AVAILABLE" BASIS. ALL INFORMATION PROVIDED ON THE SITE IS SUBJECT TO CHANGE WITHOUT NOTICE. MP3MILLION DISCLAIMS ALL WARRANTIES, EXPRESS OR IMPLIED, INCLUDING ANY WARRANTIES OF ACCURACY, NON-INFRINGEMENT, MERCHANTABILITY AND FITNESS FOR A PARTICULAR PURPOSE. MP3MILLION DISCLAIMS ANY AND ALL LIABILITY FOR THE ACTS, OMISSIONS AND CONDUCT OF ANY THIRD PARTIES IN CONNECTION WITH OR RELATED TO YOUR USE OF THE SITE AND/OR ANY MP3MILLION SERVICES. YOU ASSUME TOTAL RESPONSIBILITY FOR YOUR USE OF THE SITE AND ANY LINKED SITES. YOUR SOLE REMEDY AGAINST MP3MILLION FOR DISSATISFACTION WITH THE SITE OR ANY CONTENT IS TO STOP USING THE SITE OR ANY SUCH CONTENT. THIS LIMITATION OF RELIEF IS A PART OF THE BARGAIN BETWEEN THE PARTIES. Mp3million reserves the right to do any of the following, at any time, without notice: (1) to modify, suspend or terminate operation of or access to the Site, or any portion of the Site, for any reason; (2) to modify or change the Site, or any portion of the Site, and any applicable policies or terms; and (3) to interrupt the operation of the Site, or any portion of the Site, as necessary to perform routine or non-routine maintenance, error correction, or other changes. 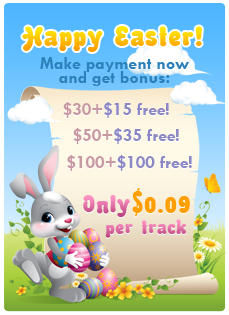 Site offers the possibility to purchase gift cards with the prepaid amount for everyone who uses its service. Every registered client can purchase a gift card for making the gift to his friend. Sender's account is debited only for the card amount plus appropriate bonus from the current balance at Mp3million.com. The gift card is sending to the recipient by the email and contains special code which should be redeemed at the website to credit the balance. To use this card the recipient must have his own registered account at Mp3million.com. Please note that gift cards are non-refundable. In addition to providing you with a more personalized online experience and facilitating your downloads, Site uses your personal information to present a wider range of products and services with convenient access to you. As well, Site uses your personal information to keep in touch with you and provide updates about new products, promotions, offers, contests, and any other information. Copyright © 2006-2019 Mp3million LTD. All rights reserved.